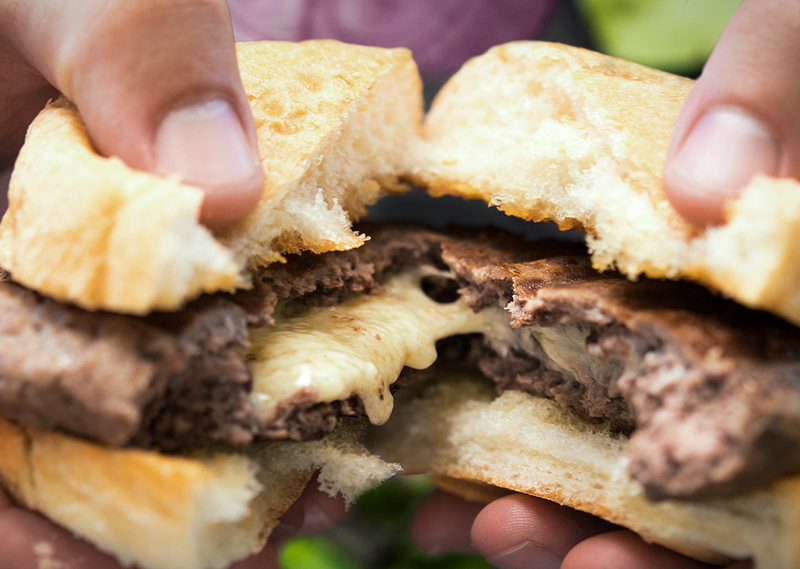 Great things have come from Minnesota, none better than the Juicy Lucy! Contain your cheese so you have more toppings on this mouth watering grilled burger. In a medium bowl, mix together the ground beef, salt, onion powder, garlic powder and Worcestershire sauce. Divide the mixture into 10 even sized patties. Cut the cheese into 15 strips. Press a small indent in 5 of the patties. Place three slices of cheese in the indent and cover with the other patty. Press the sides together to seal in all of the cheese. Preheat the Indoor/Outdoor grill on Setting 4. Place the burgers on the preheated grill. Place the lid on the grill. Grill the burgers for 4-5 minutes per side for medium rare, and 6-7 minutes per side for medium. Top one bun with a burger, lettuce and tomato. Serve immediately for perfectly gooey cheese.